For years, there's been buzz in the US food world that's had Filipina grandmothers fiercely guarding their recipes. Now, it's official: Pinoy food has finally hit the American mainstream. We're not at peak ube yet (that's purple yam, for the cheap seats), but the Philippines is making its mark on the American dining scene. This year, Bon Appetit named Washington, DC-based Filipino restaurant Bad Saint the second-best restaurant in the entire country. Meanwhile spots throughout the country -- from LA's The Park's Finest to Vegas' Full House BBQ, Chicago's Uncle Mike's, and New York's Jeepney – are putting their traditional (and elevated) takes on classics front and center. Filipino chefs in non-Pinoy kitchens are spreading their homeland love too. Executive chef Angela Dimayuga riffs on her grandmother's pollo relleno (stuffed chicken) at NYC hotspot Mission Chinese Food. Rodelio Aglibot offers crispy pata (pork shank) at E+O, a high-end, sustainability-focused Chicagoland hotspot. One of Portland, Oregon's most acclaimed restaurants, Clyde Common, often serves Carlo Lamagna's takes on Filipino cuisine on its otherwise modern American menu. Still, Filipino food in the US has struggled to convey its complex identity precisely because it's so multifaceted. And as much as purist parents will huff that some upstart Filipino restaurateur is being too "fancy," there's so much more to explore and the beauty lies in just how inclusive the cuisine can be. It's an exciting time to expand your palate, as well as your stomach (Filipinos do not skimp on portion size). Before you order, here's a primer on how to go from beginner to pro. Calling Filipino food complex is like calling Andre the Giant big. It's true, but it's definitely an understatement. Over the centuries, colonizers and traders from places as wide-ranging as Spain, India, China, Malaysia, and America have waded into the pristine beaches of the Philippines' 7,107 islands. They left behind a dizzying array of flavors, and an entire diaspora's worth of dining options that vary greatly between the country’s regions. Still, there are dishes you'll see on pretty much any menu, like these staples. A variety of Chinese-influenced egg rolls filled with anything from shrimp to vegetables, tofu, nuts, and ground meat (or all of those things), lumpia are served with everything from sweet-and-sour sauce to banana ketchup. They're one of the country's most common appetizers. This is the quintessential native dish: vinegar-braised meat sometimes cooked with soy sauce, bay leaves, peppercorns, and coconut milk. It's a meal so essential and yet so wide-ranging, the phrase "my mom's adobo is better than yours" is grounds for a duel to the death among Pinoys. It's usually served over rice. Whether you're supposed to pour the rich juices over said rice is a point of contention. Just do what makes you happy. A soup often made with seafood or pork ribs and soured with ingredients such as tamarind, lime, mangosteen, and even rhubarb, this has a seemingly permanent place at Filipino tables. There are many, many variations on it, and the stuff floating around in that rich sour/savory broth varies from kitchen to kitchen, depending on what’s available. 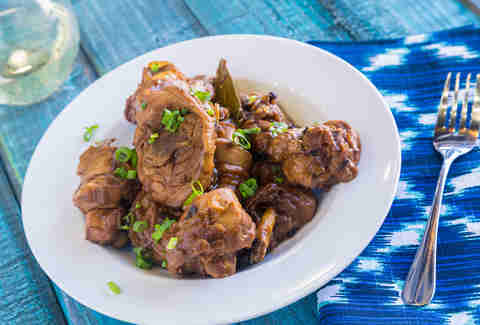 An oxtail stew rich with peanuts, kare-kare was traditionally made from the excess ingredients that didn't make it into other dishes, a panoply of veggies, offal, and, of course, those meaty oxtails. 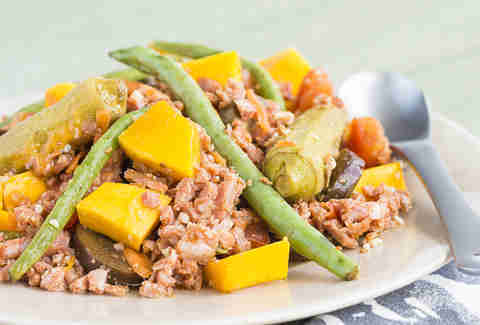 Then it's loaded with crushed peanuts or peanut butter, filled with veggies, and served either on its own or over rice. Most restaurants aren't fully equipped for roasting a whole suckling pig (lechon), but you can often find this condensed version, which consists of chunks of pork belly -- skin, meat, fat -- fried to tender/crisp perfection. Anthony Bourdain declared the stuff in the Cebu province "the best pig ever." If America-based restaurants keep it up, Cebu might have some competition. Chunks of grilled chicken, marinated and roasted on a stick and bathed in vinegar-based juices. This simple take on the skewer originated in the Western Visayan city of Bacolod, the City of Smiles. This dish might be the reason for those grins. Just like American greasy-spoon diner staples (scrambles, steak and eggs, etc. ), silogs are the go-to way to start a day in Pinoy kitchens. The omnipresent ingredients are fried rice and eggs. From there, you can see anything from sausage to fish, leftover adobo, and, yup, SPAM on the spread. We're not going to address the SPAM thing here. Just know there's a can in basically every kitchen. There's an old belief that eating long noodles helps to lengthen your life. But you could spend a whole lifetime slurping noodles and still not get a taste of everything in the Filipino noodle roster. 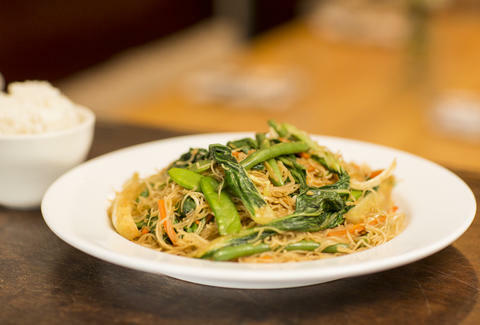 Many noodle dishes fall under the umbrella term of pansit or pancit, though no two are the same. That's because, when you're dealing with food from a nation of islands, each region's signature noodle dish is dictated by what grows nearby. That practice of dressing up pansit with local ingredients has carried over to US kitchens, too. For example, chef Cristina Quackenbush of New Orleans' Milkfish (both the pop-up dinner series and soon-to-reopen restaurant) relies on Louisiana flavor in her pansit Malabon, drenching thick rice noodles in an orange shrimp gravy before topping it all with boiled eggs, squid, and chicharron. She's one of the few big-name chefs incorporating local ingredients into Filipino food in Louisiana, also home to the US' first Philippines settlement. This dish is a lot like lo mein, with wheat flour noodles sauteéd with basically any meat, plus fresh vegetables, water chestnuts, and a rich (but not thick) gravy. It's also one of the most common pansit dishes across the board, and a reliable go-to pick when you're feeling indecisive. This is a mainstay when Pinoy cooks are feeding big crowds at dinner (so, basically every Filipino meal), a simple but explosive mixture of thin glass noodles, pork (or other meats), veggies, and soy sauce that's basically a noodle-based alternative to fried rice. Consider this the Pinoy equivalent of ramen, with a little pho in the mix as well. It's a labor-intensive, rich, aromatic bone broth loaded with noodles, intestines (that you can pretend are noodles), and onions. It's a quintessential comfort food and a great chicken soup alternative when you're not feeling so hot. It looks like wonton soup, probably because those who created it in the city of Iloilo way back when were heavily influenced by the Chinese comfort food. Meat-filled dumplings? Check. Shredded chicken and scallions? Check. Simple broth? That's where things diverge, as this is a typically rich (that's a theme in these soups) broth that permeates every bite and warms the whole body. The noodles in this soupy dish are thick… twice as thick as the Bihon ones, and loaded into a rich broth of pork and chicken (and other ingredients, depending on who's cooking) that often toes the line between broth and gravy... though, again, it depends on who's cooking. Hopefully that person has a thing for shrimp, which take this to the next level. Among Pinoys, there's a long-running misconception that Filipinos are deathly allergic to anything that doesn't contain pork. But with one of the richest biodiversities in the world, Filipinos feast upon an abundance of veggie dishes. Sure, a lot of them get gussied up with meat, but you can get them without it, too. They come in a ton of different varieties, and are essentially salads. But you aren't going to find a lot of lettuce in the traditional versions. Or ranch. Instead, they're marked by bitter melons, radishes, seaweed, and other bold flavors. American pickles can be boring… dill, bread-and-butter, and the others are little more than vinegared-up cucumbers. Atcharas, on the other hand, function as both a side and a complement. They start with papaya, but it's the other fruits and veggies that dive into the same vinegar bath that really make each version explode, with everything from peppers to carrots, raisins, pineapple, and, yes, good ol' cukes adding new meaning to "taste the rainbow." Burnt coconut cream (sometimes kicked up with jicama) can take any flavor profile up a notch. But throw in some extra char from a grilled eggplant and you've got a straight-up explosion of sweet and savory flavors that manages the tough feat of being rich and reasonably healthy at the same time. A dish more for the pescatarian crowd (though it can be made full-on vegetarian), pinkabet is essentially a vegetable medley dish -- eggplant, bean sprouts, bitter melon, peppers, okra, tomato, basically whatever's chilling in the produce section -- steamed and shriveled in fish sauce and usually served over rice. The best versions are made with bagoong, a fermented shrimp paste that reigns supreme in the Kingdom of Umami. The Philippines is also home to a big drinking culture (fact: the Philippines' Tanduay is the world's best-selling rum), and as such, it's also home to great drinking and late-night street food. And while you're not seeing a ton of US vendors selling balut (boiled embryonic chicken eggs) or Betamax (congealed blood), even non-Pinoy bars are starting to catch on to the wonders of the diaspora's salty drinking snacks, with food carts also popping up for a taste of Cebu street cuisine. 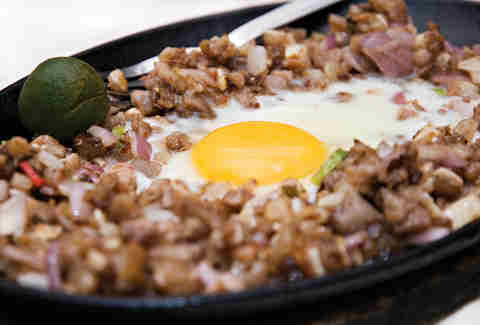 Usually made with pig snout and ears, it's topped with a raw egg and a squeeze of the Southeast Asian lime, calamansi. Considering America's obsession with crispy pork, it's no surprise this is showing up on more high-end pub menus, as it's a big sizzling hot-iron plate of sizzling, fatty-pork euphoria. Finally, something without pork belly! This is a simple dish of tuna belly, dressed up with sesame, soy, and other marinades, then grilled tender and crispy on hot coals. In the majority Catholic Philippines, this is an essential for Lenten feasts where people just can't do without some belly on a night out. Surf & turf joints, take notice. This dish combines pork belly and ceviche. Crispy. Chewy. Bright. Citrusy. One bite, and pork-free ceviche is basically ruined for life. After a few drinks, you need a bar snack. And a big ol' bowl of salty, fried pork and tofu -- minimally dressed with soy and vinegar -- will forever render bar peanuts disappointing. Or most other bar snacks. Because, again, it's just a big ol' bowl of seasoned, fried pork. You might find tapa floating around on other dishes, but the thin-sliced meat -- beef, venison, or mutton --- is essentially Filipino jerky. It's great with pickled veggies, essential with beer. Every region of the Philippines seems to have its own take on longganisa, the country's signature sausage. It can be made with many different meats, but it's usually pork (of course it is), it's usually garlicky, and it's definitely going to be punched up with a huge variety of spices so that no two versions are the same. It's great as a main course, as a breakfast side, or diced up in rice dishes. Or just gnawed between shots of Tanduay. Andy Kryza contributed to this report. Paolo Española has eaten "Filipino" food from his beginnings in Saudi Arabia to his current station of New York City and regularly hosts pop-up dinners and podcasts. Follow him to where the feasts are @errant_diner.